Looking at the wider Wellington region, Porirua values have grown strongly since April’s index (+3.0%) but did in fact plateau in the month since June’s results. 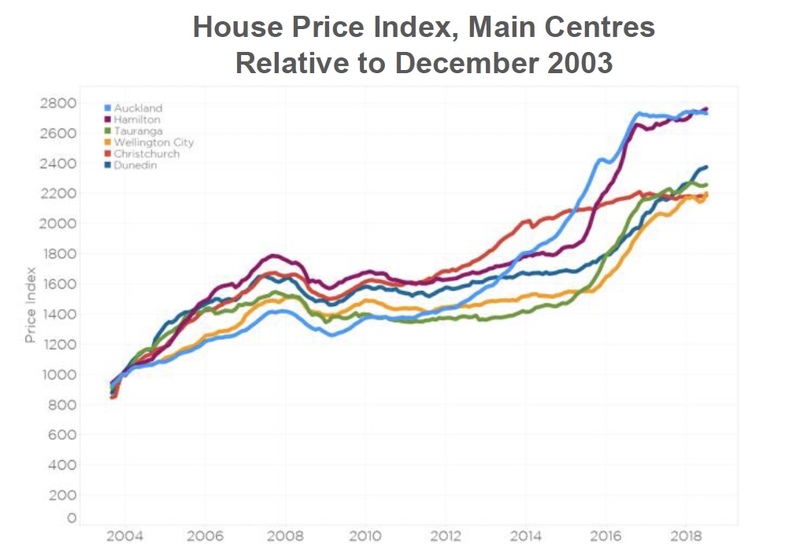 Meanwhile value growth in both Hutt City and Upper Hutt has been more modest but consistent. Values in Dunedin continue to grow, with 0.4% growth since the June index keeping the quarterly growth figure at 1.7% - the best of our six main centres. 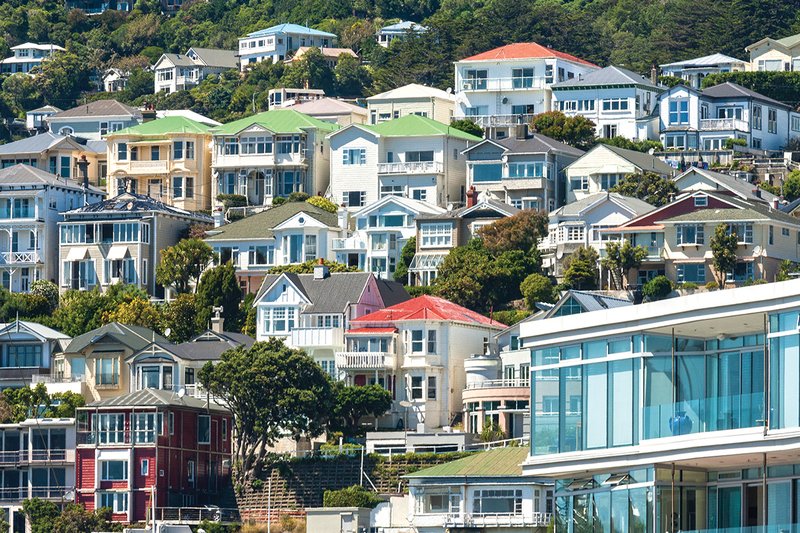 According to the July results, Auckland was the only main city to see some value depreciation – by 0.3%, however values are marginally up over the three month measure. This is unlike Tauranga, where values remain 0.2% below April, despite a 0.4% lift in July’s figures. In Christchurch, values remain slightly below those of a year ago, averaging $495,692 as at the end of July 2018. Invercargill and Palmerston North were the only two centres to buck the trend of a slowdown in annual growth, with very minor (0.1% point) increases. 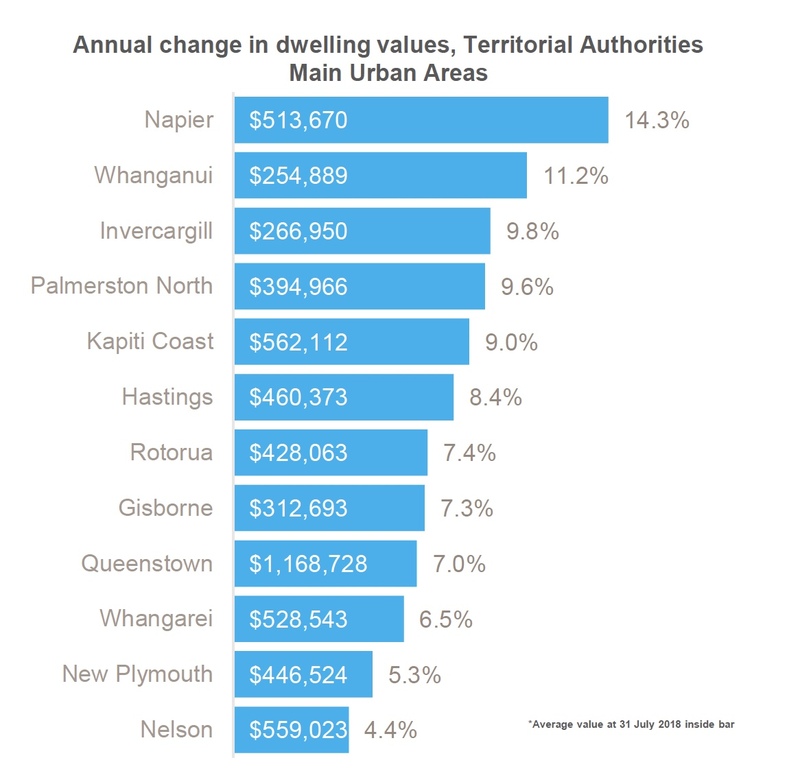 Elsewhere, Napier retains top spot, with the strongest annual growth of the main urban areas – however the continued reduction in annual growth rate, now 14.3% - down from 17.6% at the end of April – epitomises the expected slowdown outside the main centres. Nearby Hastings has seen a similar slowdown (from 12.5% at the end of April to 8.4% at the end of July). The lower value centres of Whanganui and Invercargill continue to experience growth of roughly 10% or more, as does the slightly higher value Palmerston North. Meanwhile values in Gisborne, which has a similarly lower value profile, continued to slow, with the annual growth rate down to 7.3% (from 10.1% at the end of May 2018). 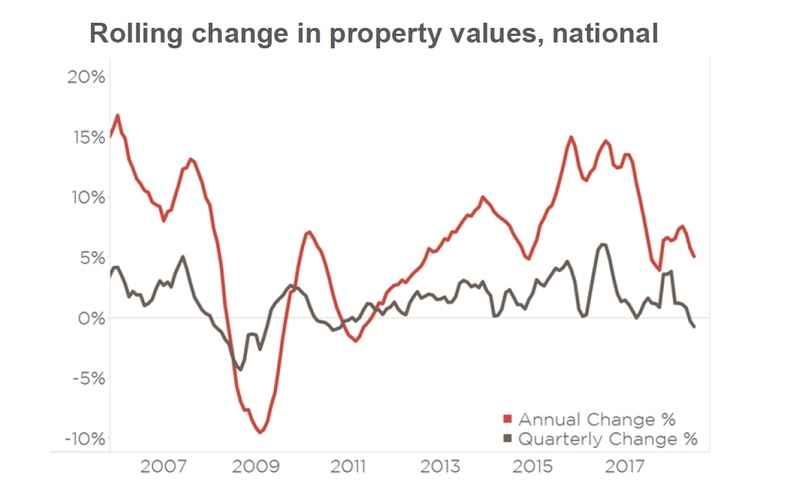 Despite the slowdown in values, however, Gisborne’s property market looks likely to stay supported by the underlying economy. Indeed, ASB’s Regional Economic Scoreboard for the March quarter ranked Gisborne a respectable 6th out of 16 regions for recent economic performance. Key industries in Gisborne include agriculture, forestry, and viticulture, which are all pretty strong at present. Tourism in the area is also doing well, with guest nights hovering at around record highs. As flagged last month, New Plymouth is an area of interest as anecdotal reports of local discontent increase in response to the Government announcement of no new oil and gas exploration permits being granted. 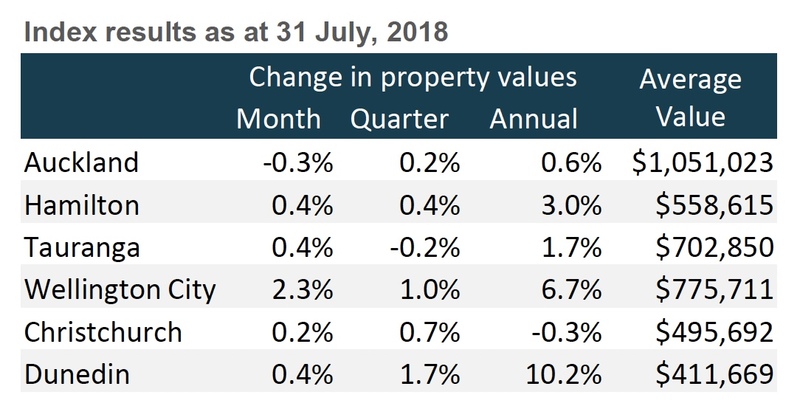 Values in New Plymouth decreased between the June and July indices and the annual rate of change dropped further to 5.3%. Nelson is the only main urban area to have experienced annual growth lower than this, as the higher average value ($559,023) impacts affordability, especially as credit from banks remains tight. While Mr Goodall isn’t expecting a change to the OCR rate (currently 1.75%) at the 9 August 2018 RBNZ announcement, he said the accompanying monetary policy statement will be keenly awaited. Currently, one of the most talked about market factors is the supply side of the equation, with KiwiBuild front and centre. Building consent statistics remain very strong, which is important to make up for the lack of building earlier in the decade. Crucially, this is especially the case in Auckland, and intensification via more townhouse type consents is also encouraging. We still have a long way to go however, and longer term this intensification will need to increase further, with a response in apartment building, especially along common public transport routes. KiwiBuild’s role in adding to supply and ensuring affordability of new builds will remain under the spotlight, but with momentum beginning to build, there is optimism within the industry.